WHEW. THE LAST COUPLE OF WEEKS HAVE BEEN a whirlwind of activity on the national policy front and we decided it would be helpful to take a moment and fill you in on how Winter Wildlands Alliance is working to fulfill our mission and share some important ways for you to get involved and help us defend our public lands and winter backcountry. Last week we joined over a thousand people – including tons of skiers – to rally for public lands in Montana. And, like many of you we’ve been on the phone with various Congressional offices almost every day. Not only that, we’ve been continuing to meet with Forest Service decision makers, grassroots activists, and other winter recreation stakeholders to talk about specific projects and planning efforts. 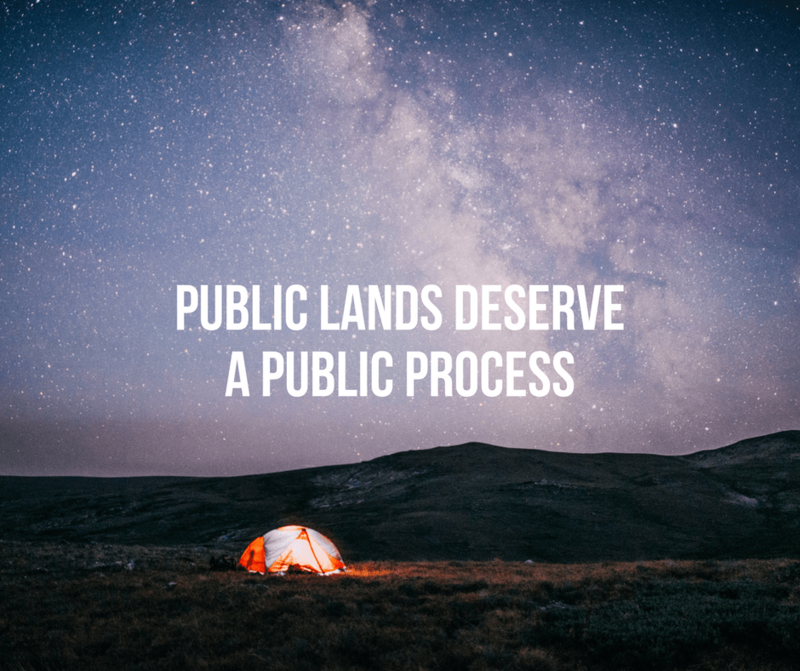 We know that our members and supporters are eager to speak out in defense of public lands so we’ve created a Public Lands Defense Web Portal that allows you to easily email your senators and representatives. This way you can let them know what you value as a constituent and what your thoughts are on the bills they are considering. You can also call the Capitol Switchboard at 202-224-3121 to get connected to your political reps.
On their first day of work this year, our representatives in Congress passed a rules package intended to pave the way for transferring or selling public lands by making these transactions budget neutral. Then, Utah Congressman Jason Chaffetz introduced two bills intended to further chip away at our public land system. The first, HR 621, would have “disposed of” 3.3 million acres of public land. However, after thousands of people called and emailed their representatives, attended rallies, and otherwise pushed back, Congressman Chaffetz withdrew HR 621. This was a huge win for public lands advocates and this success shows that your voice can make a difference. But there is more work to do. Chaffetz’s second bill, HR 622, proposes to eliminate the Forest Service and BLM’s law enforcement ability and instead put local sheriffs in charge of protecting public lands. Local sheriff’s departments are already maxed out and there’s no guarantee that they will be familiar with, or choose to enforce, the rules and regulations that have been put in place to protect our public lands. Without the ability to enforce their own rules the Forest Service and BLM will have to stand by and watch as illegal roads proliferate, priceless artifacts are looted, and the safety of everybody seeking to enjoy our public lands is compromised. Winter Wildlands Alliance focuses a lot of attention on winter travel planning but these plans are meaningless if the Forest Service can’t enforce them. Action: Tell your reps that HR 622 would jeopardize the places and experiences you care about. 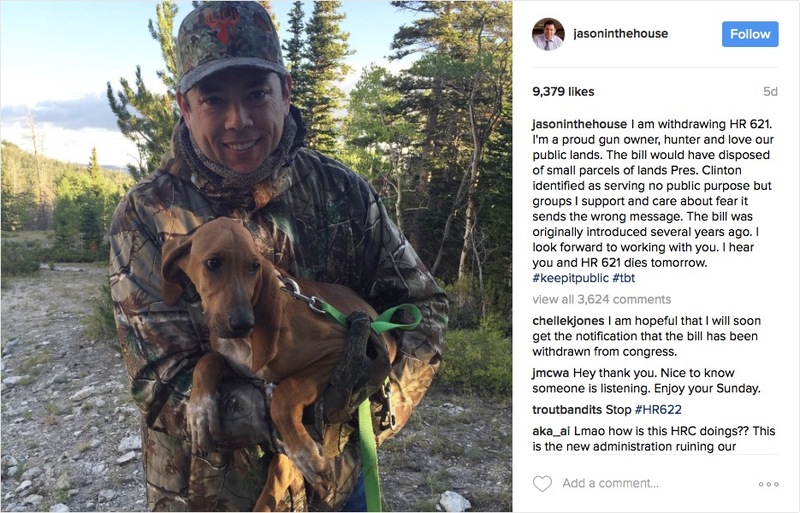 On Instagram, under pressure from constituents, Utah Rep. Jason Chaffetz withdraws his bill to “dispose of” public lands. Last week Arizona Congressman Paul Gosar introduced a resolution (H.J.Res.46) to roll back the National Park Service’s authority to regulate private oil and gas drilling within National Parks. The Park Service predicts that if this bill were to become law new oil and gas operations could occur in up to 30 Park units, including Grand Teton. Action: Let your reps know that oil and gas drilling has no place in our National Parks and that they should work to strengthen, not weaken, protections for parks. The Bureau of Land Management (BLM) manages a lot of land in the West, including some really great ski terrain near Silverton, CO as well as a ton of land in Alaska. Under the Obama administration the BLM updated how they write their long term management plans. This “Planning 2.0” rule modernized BLM planning and does a much better job of recognizing the value of recreation. Unfortunately, some members of Congress are proposing to overturn the Planning 2.0 rule using the Congressional Review Act, taking us backward instead of forward. This sounds wonky—and that’s partially what makes it vulnerable in these times—but it will have real impacts on public lands and recreation. Action: Check out this Outdoor Alliance blog post and take action. Let’s not let this Congress roll back the public process and undercut the importance of outdoor recreation by throwing out a crucial regulation that modernizes how the Bureau of Land Management (BLM) conducts planning on our public lands. At Winter Wildlands Alliance we work to protect public lands, wild winter landscapes, and opportunities for human powered winter recreation. These are non-partisan issues and we work with members of Congress on both sides of the aisle and, through our partners at Outdoor Alliance, the broader outdoor recreation community. Your personal outreach to your political representatives is super important and has already made a difference for public lands this year. Keep it up and we will continue to advocate for the backcountry public lands experience we all love.